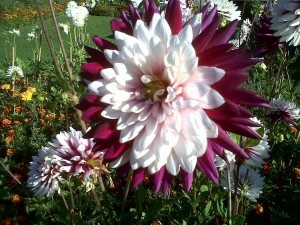 The question is, who pees on the dahlias? | Guten Morgen Berlin! 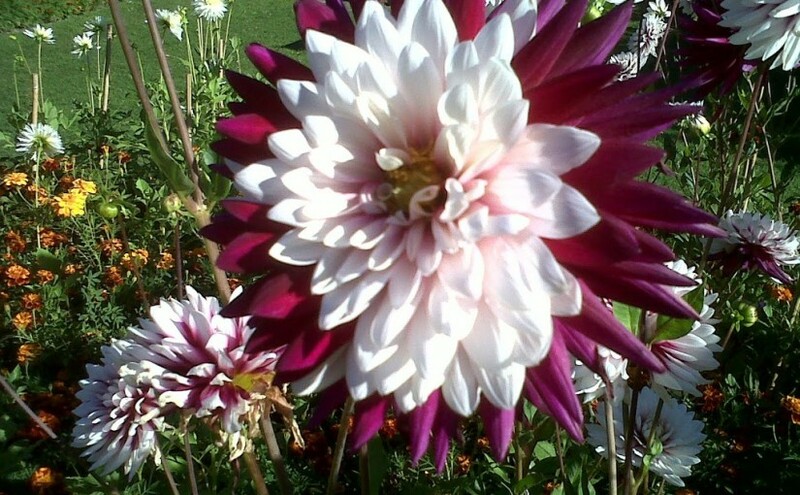 The question is, who pees on the dahlias? September 14, 2013 January 11, 2015 - Guten Morgen Berlin! This flower is as beautiful as Monty Don’s soul. Shortly after my recent move, I had a birthday. Well, one day after my recent move, I had a birthday. It was not ideal timing for enjoying oneself, and I spent my actual birthday at work on a rainy day with the remnants of an old bag of sweets to count as my cake. My colleagues (I am smitten) bought me a chili plant and a beautiful orange teapot, plus I was also taken for a ‘business coffee’, so it wasn’t all bad, but it wasn’t much of a shebang. So when my mother came to visit the following weekend for a belated celebratory weekend, we chose to do something which would deeply, shamelessly indulge our nerdy glee; we went to visit a garden. 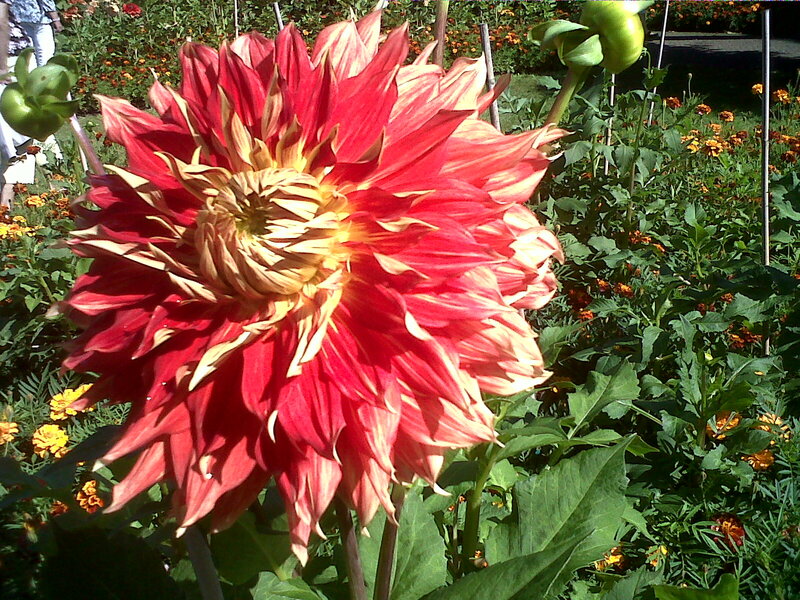 Specifically, the Britzer Garten, which was holding a Dahlia festival (‘Dahlienfeuer’, fire of dahlias) that just so happened to be in full pompom mode on the most perfect, golden-sunny, honey-warm September day. You’d probably all recognise dahlias even if you can’t put the name to the face; they’re the big, ball-shaped, madly colourful flowers you see in horticultural competitions or singly perched in a vase in the lobby of a pretentious hotel. What I cannot possibly show in one photo alone is the sheer scale of the Britzer dahlia festival. It is a horde, a giant sweeping rainbow mass, of pompom flowers. The colours are so intense they blaze a hole in the back of your eyeballs, and each bed of one single flower type is arranged with all the others to make an amazing colour palette, snaking around a row of angular arches in a crazy parade. Seriously you guys, it is awesome to look at. Some of the flower heads were actually as big as my own head. Some of them had genetic mutations that meant they were half one colour and half another, like the one in the top photo. And after we moved on to wander round the rest of the garden, I realised that the most unbelievable thing of all was that I had never been to, or even heard of this place before. Everywhere you come across a different and unexpected bit of new gardening magic. One part is the ‘themed gardens’, which just looks like a boring hedge maze but is actually lots of little gardens pocketed off into hedge-rooms, each one with a particular theme: one was a hilarious mixture of vegetables and decorative flowers mingled together (sprouts look particularly awesome in a formal border), one was a fruity Mediterranean terrace, and one was a deep, dark, moist dell-garden full of ferns and frogs and a little waterfall. There are big crazy triangular gardens full of blooms in one intense colour, and wide structural gardens punctuated with soft grasses and plants with fleshy, glowing leaves. There’s an enormous water playground and adventure area for kids and ample access to Wurst. It is the perfect place to be, and it is open until the end of sunset. A better way to enjoy a glass of prosecco you will not find. It was perfect timing for me to be juiced up by garden wonderment, because not long after I was invited to a meeting with the committee of the Laskerwiese community garden when after months on their waiting list some beds had finally become up for grabs. I hightailed it down to Ostkreuz on Thursday evening already planning the rows of golden beetroot and purple carrots I would be tending withing weeks – no, hours of getting my own little plot. The committee was an interesting bunch: the chair, a rodentine woman with a ginger bob and nibbly teeth, tsked as I arrived two minutes late; her husband was a large and jocular man who was exactly like Jerry from Parks and Recreation and spent the entire meeting maintaining a constant flow of cake into his mouth; a few normal-looking midle-aged ladies; an adorable young couple who clearly had more than just soil fertility in mind; Heath Ledger with his Knight’s Tale hairstyle but with a huge bald patch on the very top of his head so his wild hair arranged itself like that of Krusty the Klown; and an enormous woman in the corner with long, tentacley dreadlocks swirled into an unravelling mound on the top of her head and tattoos all around the edge of her face and around her eyebrows so she looked like a shaman. We newbies introduced ourselves in the usual shy-awkward manner and then one of the heads of the committee, a proper hippy with a goatee and a ponytail, announced that the situation was rather awkward as there were two beds and three applicants. One, a dedicated old lady who had lived in Friedrichshain for most of her life; another, the couple, who had recently moved from a farming village and were both attractive freelance musicians and were so wholesome they made me want to puke; and then a stubby, flustered English girl wrestling with an enormous rucksack and unknowingly with black mascara-rings under her eyes from glaring at financial reports for hours on end. The sharp woman with the ginger bob sourly remarked that the person who arrived latest should be the one not to get a bed, darting her eyes at me in a venomous squint. The Hippy suggested instead that we draw matches. I drew the short match. So then, without a bed and with very little energy left from the day, I had to sit through a committee meeting of which committee I was not a part. Like all committee meetings for anything ever in the world, hours were spent debating things like who will hold the keys for the shed, when will we schedule our next meeting, when will we schedule the deadline for suggestions for the date of our next meeting…a symphony of admin. “Two things,” said Jerry. “One: there were some lads hanging around near the garden the other day just drinking some beers, and he went over to them and really let loose, they practically had a heart attack, you should have seen the fear on their faces. Two: a lady was going by the garden with a pram last week, and he came out of the garden to tell her she was pushing the pram wrong and started instructing her on how to push the pram. That’s all I have to say on the matter.” For minutes and minutes everyone wheeled out new and ever more mindblowing examples of Tony’s deranged antics, from sleeping in his veg bed to walking naked through a foot of snow in a particularly bad winter. It seemed clear that Tony’s bed would have to soon be made available to a new member, and that I might soon have the opportunity to be tilling soil with a very particular organic additive. “Well, I think we all agree then,” said the hippy, “we’re not happy to kick Tony out.” Before I could go ‘WHUH?’, he continued, “We all agree we’re at least not happy to come to a decision tonight.” Everyone nodded solemnly. “So shall I write for the records that we were unanimously agreed that we still don’t know what our decision is?” asked the chairwoman. Everyone nodded solemnly again, the meeting was brought to a close with thanks and special mentions, and with that Tony was saved, at least until the next committee meeting. ← I went to Ikea.